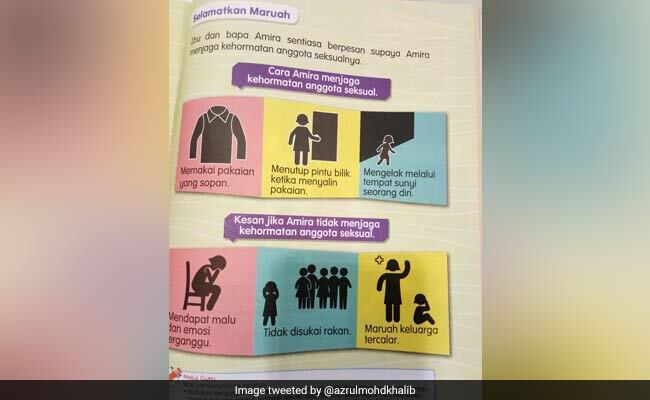 Malaysia: Anger Over Textbook Advising Girls To Protect "Modesty Of Sexual Organs"
Anger Over Textbook Advising Girls To Protect "Modesty Of Sexual Organs"
The pictures in the textbook informed girls about ways to protect "the modesty of her sexual organs". Malaysia's government will alter an elementary-school textbook which suggested girls should dress modestly to prevent sexual assault, authorities said Wednesday, after it sparked widespread anger. Social media exploded with outrage after images circulated of a section of the book, which is used by nine-year-olds, entitled "Saving one's modesty". It featured a series of pictures of a fictional girl called Amira, whose parents advise her to protect "the modesty of her sexual organs" by wearing the correct attire. "We are appalled," said Meera Samanther, vice president of rights group Women's Aid Organisation. "The educational material sexualises nine-year-old girls, teaches them to be ashamed of their bodies, and shifts the blame from the perpetrator to the survivor of sexual assault." The health ministry was criticised in 2017 for offering cash prizes for the best videos explaining how to "prevent" homosexuality. The competition was amended following an outcry. In A First, Belgian Man Convicted Of "Sexism In A Public Place"